Very comfortable with friendly staff. Wonderful dinner at the bar with my server Ashley being outstanding! A server that was in time every time and actually knew what a Pittsburgh rare steak is. Not the mention the chef actually cooked my steak correctly! I would definitely stay here again. 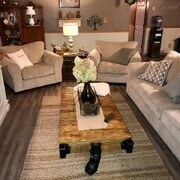 The room was extremely comfortable and clean. I got into town late and wasn’t able to use the pool but it looked great! Lots of options for breakfast, too. I would definitely stay here again. Where to find Glouster hotels near an airport? Where can I find hotels in Glouster that are near tourist attractions? 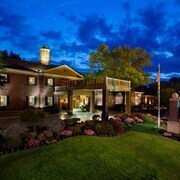 We recommend you book well ahead as there are not many Expedia-registered lodgings in or around downtown Glouster. 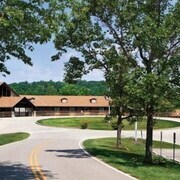 The Burr Oak Lodge & Conference Center is the nearest hotel to downtown Glouster and is only a quick drive away. 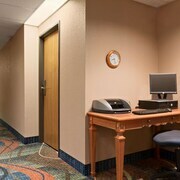 You could investigate the Hampton Inn Athens or the Holiday Inn Express Hotel & Suites Athens. 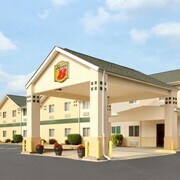 The Hampton Inn Athens is located 20 kilometres (13 miles) away from the main part of Glouster. The Holiday Inn Express Hotel & Suites Athens, is 20 kilometres (13 miles) away. The Ohio University Inn & Conference Center and the Baymont Inn and Suites Athens are two more Expedia-listed options in Glouster. While you are in Glouster, ensure you have enough time to investigate more of Southeast Ohio. Southeast Ohio is known for rolling hills and foothills. Commonly visited Southeast Ohio visitor attractions include historic bridges. In this section of United States of America tourists may partake in mountain biking and hiking. While in Athens you can make a visit to the Brass Ring Golf Club and stay the night in Logan, which is 30 kilometres (18 miles) to the west of the center of Glouster. 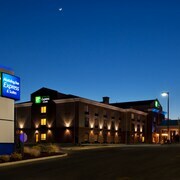 The Baymont Inn & Suites Logan and Holiday Inn Express Logan are among the choices. If watching sport is what you love, make the time to visit Columbus Crew Stadium, which is 95 kilometres (59 miles) to the northwest of Glouster. Sports fans wanting to sleep nearby can make a choice from the Renaissance Columbus Downtown Hotel or the Hilton Columbus Downtown. If you are flying into Glouster, Mid-Ohio Valley Regional Airport is a convenient airport. It is 60 kilometres (36 miles) away. Sunshine Lodge is close to the airport. What are the most popular Glouster hotels? Are there hotels in other cities near Glouster? What other types of accommodations are available in Glouster? Explore Glouster with Expedia.ca’s Travel Guides to find the best flights, cars, holiday packages and more!